What makes a climb epic? I would say it is the combination of the difficulty, the weather conditions, your physical conditioning on the day, and what came before or after the climb. Which climbs do you think of when you think of the difficulty of the Tour de France, perhaps Mount Ventoux, Alpe'd'Huez, Tourmalet, Hautacam, Galibier? All of these climbs are considered so hard that they do not classify them – they are infamously known as hors catégorie climbs. The toughest of the tough. For Tour de France organizers the difficulty of a climb is established by its steepness, length, and its position on the course. The road conditions are also considered. Climbs are graded from 4 (easiest) -1 (most difficult), or HC (hors catégorie). In the Tour de France the climbs are so revered that on the last climb of a stage, points are doubled for categories two, one, and HC. The fastest overall climber (to reach various designated hills and mountains along the route) earns the very recognizable polka-dot jersey (maillot à pois rouges). The best climber was first recognized in 1933, prizes were awarded beginning in 1934 and the special red and white jersey was first introduced in 1975. The wearer of the polka-dot jersey is affectionately called the King of the Mountain. The most well known King of the Mountain was seven time winner and Frenchman Richard Virenque (1994, 1995, 1996, 1997, 1999, 2003 and 2004). 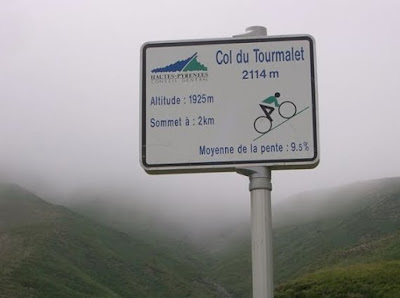 The French like to celebrate, and in 2010 we celebrate the 100th anniversary of the big mountains in the Pyrenees being included in the Tour de France. One hundred years ago, 110 brave riders rode an epic 203-miles (the stages were longer back then) over the Col de Peyresourde, Col d’Apsin, Col du Tourmalet, Col du Soulor, and the Col d’Aubisque. That year, 26 riders had pulled out just prior to the race upon hearing the intended route over the Col du Tourmalet (rated the most difficult). This year the Tour de France honors those first riders by including a highly anticipated all-out brutal 196-Km race over the same four mountain passes. 220 riders should begin the Tour in 2010, there is no telling how many will finish. 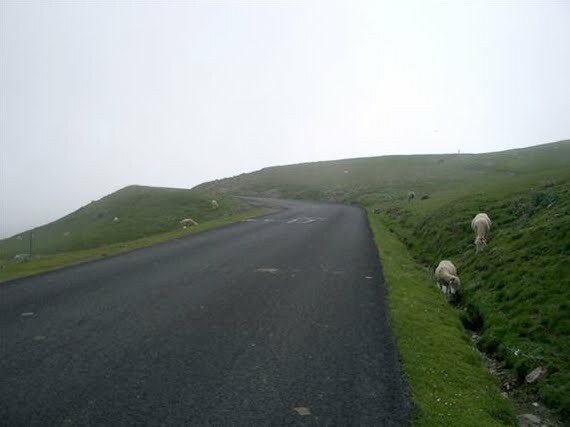 As an indication of the difficulty of these peaks, the Broom Wagon was first introduced in 1910 in response to the riders objections to the condition and length of the proposed stage. "The Circle of Death" as it was nicknamed, was again ridden in 1926. 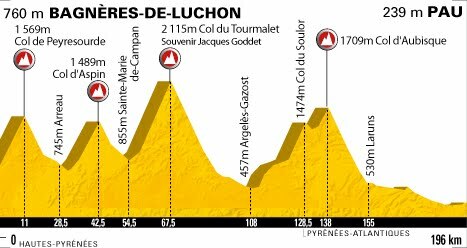 It has been 41 years since the Tour de France included all four of the Pyrenees' most punishing ascents in one day. In 1969, Stage 17 saw Eddy Merckx ("The Cannibal") take off on an 87-mile solo breakaway, finishing first at Mourenx after crossing the same four peaks. Today beautiful roads are laid down over these high mountain passes in the Pyrenees making them a wonderful place to ride a bike, or park your RV, picnic and wait for the modern riders to pass by with ease. Be sure to watch Stage 16 (July 20th) and Stage 17 (July 22nd) of the 2010 Tour de France.